Florida’s Silviculture Best Management Practices (BMPs) identify the minimum standards for protecting and maintaining water quality and certain wildlife habitats in Florida. When properly applied, silviculture BMPs provide a balance between forest resource use and natural resource protection. The 2017 Florida silviculture BMP implementation survey showed a 99.6% implementation rate among forestry operations. This indicates that water quality protection remains a high priority for Florida’s foresters, land managers, loggers, and silviculture contractors. The 2017 survey evaluated 3,074 practices on 163 individual forestry operations (sites). This cooperative effort involved 108 individual public and private landowners and covered 34,492 acres in 44 Florida counties. Eighty-two sites were on private non-industrial forestland, 55 on industrial forestland, and 26 on public forestlands. Industry lands scored a 99.9% overall implementation rating, the highest among all forest ownerships. Private non-industrial lands scored a 99.6% overall implementation rating. Public ownerships scored a 99.8% overall implementation rating. Nearly 97% of all sites surveyed this year scored a 100% implementation rating. All sites surveyed scored at or above 87% in overall BMP implementation. The average for overall BMP compliance was 99.6%, a slight increase from 2015. The average compliance for the 36-year period since 1981 is 95%. A total of 5,859 individual forestry operations have been surveyed since 1981. 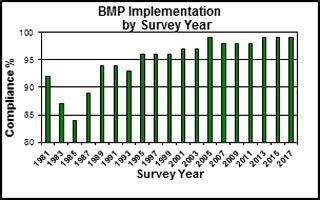 Since 1981, the Florida Forest Service has monitored forestry operations for BMP implementation by conducting biennial statewide implementation surveys. High implementation over the years illustrates the Florida forestry community’s strong commitment to protect the state’s water resources. The implementation of Florida silviculture BMPs is carried out under an educational format, designed to transfer BMP technology to forest practitioners through continued workshops and field demonstrations. Currently, Florida Forest Service personnel conduct twenty to thirty workshops annually, involving over 600 participants per year. 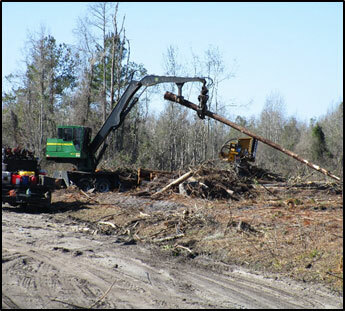 In addition, the Florida Forest Service provides BMP training directly to loggers through the Southeastern Wood Producers Association and Florida Forestry Association’s Master Logger Program. The 2017 Implementation Survey Report details compliance levels in all 14 Silviculture BMP categories. For more information, contact Jeff Vowell, Florida Forest Service, at (850) 681-5820 or Jeff.Vowell@freshfromflorida.com. The Florida Forest Service manages 1 million acres of public forest land while protecting more than 26 million acres of homes, forestland and natural resources from the devastating effects of wildfire. To learn more about the Florida Forest Service, visit www.FloridaForestService.com.